This past weekend, we tried a new-to-us restaurant: Teppanyaki Kyoto. It's in Highland Park, near Park Bruges. When we entered, it was so wonderfully warm & cozy inside on the first really cold night of this winter season. I felt like I was back in Japan as "Irrashaimase!" was called out in greeting. We hadn't made reservations, arrived a bit after 5 pm, and were seated right away. We sat at a table but in the back there is an area with a traditional tatami flooring/seating area. 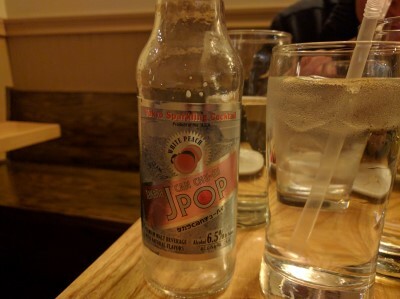 We decided to share a bottle of white peach Chuu-Hai - basically, a flavored malt beverage. It was good for something different. After living in Japan for 2 years, I am extremely particular about Gyoza. Not all dumplings are real dumplings in my mind. When I was younger, I loved dumplings at Chinese restaurants. Now, I hate them. The dumpling wrapper is too thick, too doughy, and the stuff on the inside is usually kind of revolting to me. Ick. 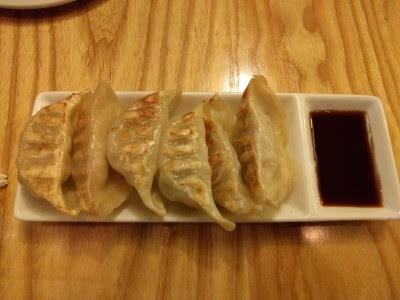 I only like gyoza dumplings - thin dough wrapper. Everyday Noodles gets it right. So does Teppanyaki Kyoto. These were terrific. Just like I remember, even the sauce. It brought back memories of many lunch meals with a co-worker at a local place. We'd each get an order of gyoza for lunch and a bowl of gohan with a small topping like ebi (shrimp) tenpura and that would fill us up until late in the evening. SP started with Daikon Salad. Daikon (mild flavored radish) is not really my thing. I'll eat it. Not wanting to offend hosts, I ate a lot of it in Japan. I like it, just not enough to go looking for it. 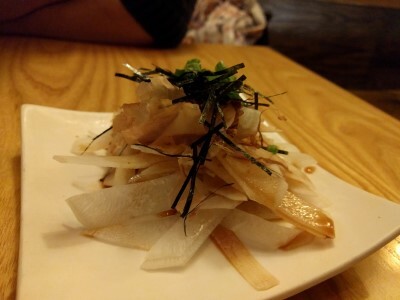 SP likes it a lot and really liked this simple salad of daikon, seawood, and bonito. I couldn't resist ordering the Korokke, mostly for nostalgic reasons. When I lived on my own, I'd stop at the grocery store after work and pick up dinner. Usually, I went for the prepared foods section. 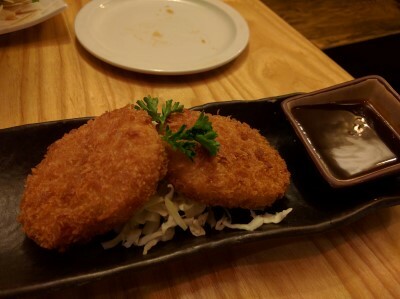 One of my favorites was korokke (croquettes) - mashed potato pancake, fried, maybe some veggie inside. These definitely lived up to memory, especially with that dipping sauce. Another nostalgic order: Yakitori. 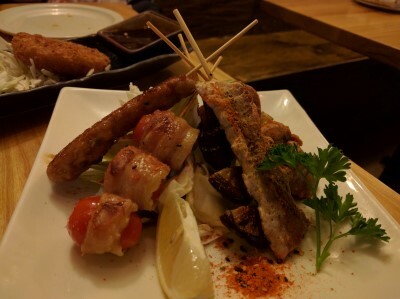 There were five skewers: tsukune (chicken meatball), pork belly, pork wrapped cherry tomato (which I'd never seen in Japan, but maybe it's a new thing, it's been a while since I was there), shiitake, and chicken with scallion. Sure, I've had versions of yakitori in the US, but none were ever as tasty as the local yakitoriya near my apartment in Kyoto. This was good, but honestly, nothing will ever live up to the memory of that yakitoriya, with the red lanterns marking the door, gathering there with friends, and over indulging in kirin and yakitori. When SP visited Japan, he had been told he had celiac disease. Turns out he doesn't. 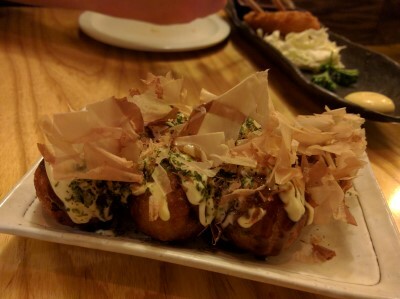 Sadly, there were several dishes he wanted to try while there but couldn't, like Takoyaki. I do not like takoyaki (octopus dumpling with bonito on top). He liked them. 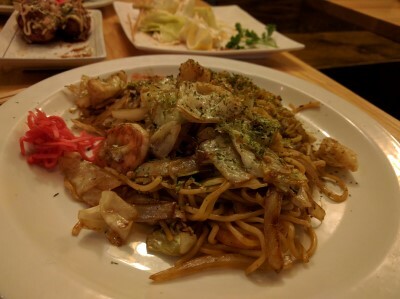 For my "main" dish I chose Yakisoba with Shrimp. This was another nostalgic choice plus I wanted to see if I would finally have a yakisoba as delicious as the ones I ate in Japan. Usually, the sauce tastes off to me. This time, it was just right. It tasted like I was back in Japan, slurping up noodles and cabbage. When Teppanyaki Kyoto opened, it was billed as the place for okonomiyaki, which is not usually a dish at Japanese restaurants here in the US. I ate a lot of okonomiyaki in Japan and while I like it, it's like daikon, something I'll eat when in Japan but not something I'll seek out. I've heard it described as Japanese pancake. It's a batter with your choice of mixed-in ingredients (okonomi = as you like it), cooked on one side then flipped to finish cooking. It's a lot thicker than what we think of as a pancake. Again, SP couldn't eat this when he was there, so he decided to try it now. He chose Okonomiyaki with Squid & Fried Egg. 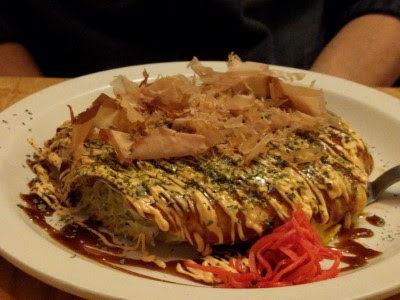 It comes drizzled with Japanese mayo (he chose spicy) and topped with seaweed powder & bonito flakes that "dance" from the heat of the okonomiyaki. I was surprised he chose this because of the batter carbs and because of the mayo drizzle. I think he liked it, he said he did, but I'm pretty sure he wouldn't order it again because of carbs/mayo. It's big and filling. I enjoyed our meal at Teppanyaki Kyoto. It brought back a lot of memories of my time in Japan and made me rather nostalgic & wistful for those days. The food I ate definitely tasted like what I ate in Japan - it wasn't some strange American version of Japanese food. Service was great. We'd go back.